Crossing the convocation stage as a new university graduate is always exciting. 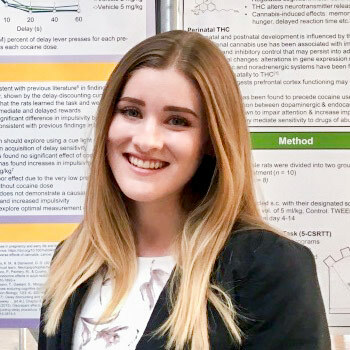 But for Emma Smith, it was extra special to know she was the first-ever person to receive a Bachelor of Science in Psychology and Neuroscience from Wilfrid Laurier University. It’s not the path Smith envisioned when she was in high school in Toronto. At the time, she wanted to be a lawyer. Psychology was just supposed to be a stepping stone on the way there. She chose to attend Laurier for its intimate campus feel and co-op program, and started her studies in psychology. Smith soon found she was more interested in psychology than law. She enrolled in the research specialist stream in her third year. However, when the Department of Psychology created the Psychology and Neuroscience stream in 2017/18, she was keen to step into it for her last year. Though future students will typically stream themselves into the new program earlier in their studies, Smith already had most of the course requirements, which encapsulated her interests. “I really enjoy the science side of psychology – understanding why the brain functions the way it does and how that controls our everyday behaviours,” says Smith. Psychology has been around for a long time but neuroscience is relatively new, with the international Society for Neuroscience founded less than 50 years ago, says Professor Rudy Eikelboom, chair of Laurier’s Department of Psychology. About a third of the department’s faculty members are experts in either cognitive or behavioural neuroscience, says Associate Professor Paul Mallet, who supervised Smith’s honours thesis. “We noticed that most Canadian universities offered psychology programs, and some offered neuroscience programs, but very few provide the opportunity to specialize in both of these fields. Laurier’s new Honours BSc in Psychology and Neuroscience program is meant to fill that gap,” says Mallet. Smith’s thesis research focused on the effects on rats of early-life exposure to THC, the psychoactive ingredient in marijuana. This was a step toward a better understanding of how marijuana use during pregnancy can affect human development. “Use of marijuana by pregnant women is surprisingly high, so this is something that has a lot of relevance to real-world issues,” says Smith. Smith exposed rat pups to THC to simulate fetal exposure. Previous research has shown that rat brain development in the early weeks of life closely mimics human brain development during the most critical fetal stages. When the rats reached adulthood, Smith investigated if the effects of their early-life drug exposure on impulsive behaviour would be worsened by exposure to cocaine. Smith didn’t actually end up finding significant differences in impulsive behaviour between the rats exposed to THC as pups and those that weren’t. That’s the way things often go in science, where minor variations in experiment design can have huge effects. Smith’s findings don’t necessarily mean early-life exposure to THC has no effect on rats, never mind on developing human brains. Other research from Mallet’s lab has shown that THC does impact development in both humans and animals. “Our earlier work demonstrated that chronic exposure to THC, especially at a young age, produces subtle but long-lasting memory deficits, increases anxiety, and alters the brain’s response to opioid drugs such as heroin,” says Mallet. Mallet and Eikelboom expect many more Psychology and Neuroscience graduates in the future, as interest in the program is strong. As for Smith, she is spending the summer at Toronto’s Hospital for Sick Children, working on a health informatics project. In September, she will start a master’s degree in occupational therapy at the University of Toronto. In the future, after gaining some clinical experience, she might consider pursuing a doctorate in rehabilitation science. Either way, her work will be informed by her training in psychology and neuroscience. No matter what Smith ends up doing, Mallet is sure she has a bright future ahead of her.